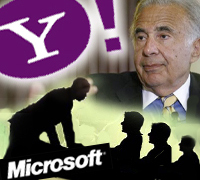 Carl Icahn, activist investor in Yahoo!, bought another 6.8 million shares of the company. According to an SEC filing, Icahn purchased the shares at $9.92 a pop bringing his total stake in the Sunnyvale based web giant on its knees to about 75.6 million shares or 5.5% of the entire company. Not surprisingly, this move by Icahn comes merely a week after Yahoo CEO Jerry Yang announced that he was stepping down. Icahn launched a proxy fight against the Yahoo board of directors earlier this year when Yang denied Microsoft the sale of Yahoo at $33 per share. To resolve the proxy fight, Yahoo gave Icahn 3 seats on the board of directors, one for him and two for people of his choosing. The new acquisition of shares by Icahn only suggests that he is in Yahoo for the long run. With the announcement of Yang’s stepping down, Icahn expects Yahoo’s stock to jump up when they have chosen a new CEO for the company. However, Icahn’s easiest option to cash in has gone. Microsoft who was poised to buy Yahoo back in February, is no longer interested. Steve Ballmer, Microsoft CEO, said in a shareholders’ meeting, "We are done with all acquisition discussions with Yahoo." Nonetheless, things may all change when Yahoo has selected its new CEO.